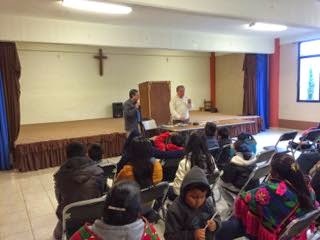 For almost 20 years, Calvary has had a relationship with a mission in the Mazahua Valley northwest of Mexico City. The Mazahua are an indigenous people group native to that part of Mexico. They tend to live in poverty or on its edge. They have made significant strides in the last few decades to create better lives, greater infrastructure, and economic possibilities in their area. Parallel to that growth has been the growth of evangelical Christianity among the Mazahua. Mazahua Valley Ministries is an organization that provides encouragement and modest support to 50-60 evangelical churches and their leaders within the Mazahua Valley area. Pastor Tacho Dominguez is on staff at Calvary as an associate pastor. He grew up in the Mazahua Valley and has a wide and deep knowledge of the history of both the region and the people. It was a real privilege to have him take me and Alan, the third member of our group, on an extended week long tour of the region. Alan had been to MVM three previous times and has a deep love for the people there. He doesn't speak a lot of Spanish, but has been a loyal volunteer there and also serves along with his wife at the Spanish language worship service at Calvary. We visited several churches each day, meeting with leaders and often sharing meals. We heard about the work of larger, more established ministries and the struggles of fledgling churches that have only been in existence a short time. I worked on my Spanish skills and enjoyed actually having a couple significant conversations in that beautiful language. It's a little strange to realize that I have a harder time talking about what to eat for breakfast than I have talking about the relationship between the gospel and politics. Not sure how that happens. One of the things that excites me most about Calvary (there are lots) is this business of mission partners -- whether locally or globally, Calvary is tied to many organizations like MVM and the individuals who give so much time and energy to building the kingdom of God in some way through these partnerships. What a privilege to be a part of such things! What an honor as senior pastor of Calvary to be able to connect with brothers and sisters who love and serve Jesus in other places! Here are a couple pictures from the trip. Above you see Manuel, Pastor Tacho's cousin, talking with people at Gilgal, the site I mentioned in my previous post. 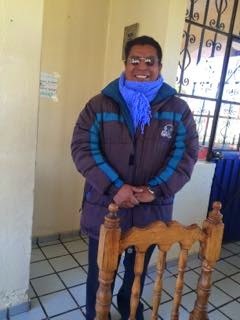 Manuel was a university professor who retired and is now giving his time to mission work. 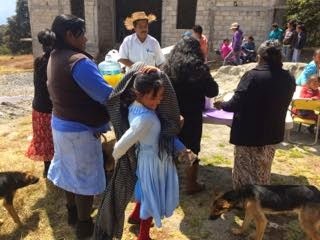 The girl in the light blue dress in the foreground is a bright-eyed, joyful helper who has become a key part of the work of Elsa, the missionary who has made the closest contact with these people. As you can see, dogs are everywhere. This is Alan teaching a group of pastors and their families (especially the kids) about morse code. It was a fascinating demonstration using some of Alan's ham radio expertise and equipment. This is a common sight -- mostly empty plates and full bellies. 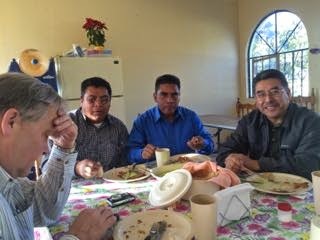 Around the table, left to right, are Alan, David (who works at MVM), Isidro (an ex-cop who did a great job of driving us up from Mexico City and back into the city -- driving in Mexico City requires a special kind of courage! ), and Tacho. 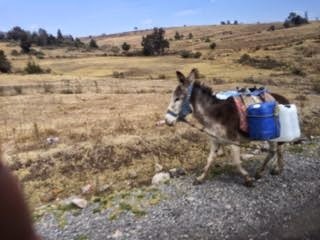 This was a photo op as we were driving up to Gilgal. In many areas this is a common way to bring water back to the home. Roca de Salvacion (Rock of Salvation) is one of the largest evangelical churches in the valley. There are about 1400 members in this church. They have a beautiful sanctuary, a dedicated leadership team, and a heart for missions. 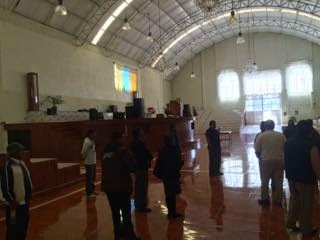 It was humbling to be prayed for by this leadership team in this beautiful sanctuary! 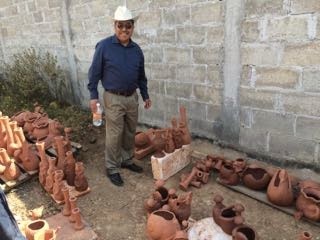 Tacho standing in the midst of a group of pottery creations near a church known as "The Potter's House." The church has helped some of the people in this area take advantage of the presence of high quality clay to create beautiful pottery and bring in a few pesos. We watched this potter creating a number of different items in his backyard. I had to laugh when people asked me if I enjoyed the heat in Mexico. It never got above 70 degrees, and that was only on the middle of the warmest afternoon. Nights were cold. Here David is bundled up to function on a morning when it was certainly under 40 degrees. With no insulation and no heat in the buildings, I was much warmer once I got back to Minnesota!